my home cooking and everything i can think of...: What really is a yogurt? What really is a yogurt? I asked this question because a lot of Filipinos do not have an idea what yogurt is or have not tasted yet. I am a Food Technologist specializing in dairy production and processing and would like to share with you some inputs about yogurt. I am producing yogurt for commercial and personal consumption. We had the opportunity to participate a couple of months ago in an Agri-Fair hosted by the City Agriculture Office of Cagayan de Oro. During the week-long event, it was an eye opener at the same time a good experience worth pondering. In one occasion, an executive–looking guy walked in and bought a bottle of blueberry-flavored Fruits and Yogurt Creations. A few steps away from the booth, he opened it and took a sip. Without hesitation, he walked back and complained it was sour. Huh, sour? I did not expect this comment. I was dumbfounded for a while before I replied. What came out from my mouth was, “That’s a yogurt sir, not a flavored milk.” Realizing that other people might hear him, he walked away with a timid smile before taking another gulp. He must have liked it already. Judging from buyers’ reactions, I found out that most of the kids love yogurt and have an idea what yogurt is but many oldies are still ignorant about it. This is probably that generation 60’s to 80’s are still used to canned and powdered milk. It was only in the mid 90’s that local milk production started. With recent trends to be health-conscious and aggressive push of multi-national companies of their products through TV advertisement, it is only now that we get to know what yogurt is. But is the yogurt that you know the real yogurt? Yogurt is fermented milk, either, set, stirred, or strained. It is made by adding bacterial culture ( Lactobacillus delbrueckii subsp. bulgaricus and Streptococcus salivarius subsp. thermophilus bacteria) to a cow’s, carabao’s or goat’s milk making it sour after a period of time. Set yogurt is milk allowed to ferment in a cup and served or sold in a form of undisturbed mass. Stirred yogurt, also known as Swiss-style yogurt, is milk fermented in a pot or vat that after the fermentation process, it is stirred to form a viscous liquid. Strained yogurt, also called Greek yogurt is fermented milk filtered or strained to remove the whey making the consistency very thick. Unflavored yogurt is called plain yogurt while added with sugar is a sweetened yogurt. If added or flavored with fruit, it will be fruit-flavored yogurt. The sweetened fruit-flavored yogurt frozen using an ice cream machine is called frozen yogurt. If yogurt is added with water, sugar and flavor, it is called yogurt drink. All of these variations should contain probiotics or live microorganisms to be called yogurt. A fermented product that does not have live microorganisms or has microorganisms but eliminated by further processing or cooking cannot be called yogurt. There are lots of yogurts in the supermarket now. Before you grab one thinking that it has probiotics in it, read the label first. You might be surprised there are also lots of dummy yogurts out there. 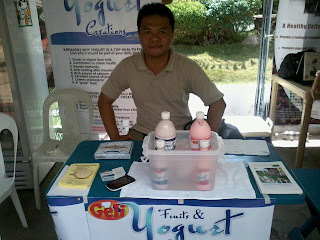 To know more of what a real yogurt should be, visit www.fruitsandyogurtcreations.com.